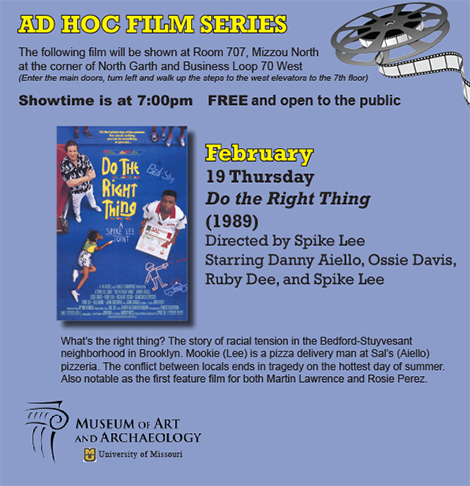 A poster for tonight's film, Do the Right Thing. Courtesy of the Museum of Art and Archaeology. Cathy Callaway has gotten surprisingly good at drawing connections between Cary Grant films and Museum of Art and Archaeology exhibitions. Callaway has been curating the museum’s film series since she became the museum educator in 2006. It might sound farfetched at first, but Arsenic and Old Lace, a black comedy about a homicidal family, was tied in to the museum’s exhibition Final Farewell: The Culture of Death and the Afterlife. And To Catch a Thief, a 1955 film starring Grant, has an elaborate ballroom scene that Callaway used to promote the museum’s annual Paintbrush Ball (happening March 21 this year). “Any excuse to show Cary Grant films,” Callaway said with a smile. Callaway’s love for movies started at the Downer Theatre in Milwaukee, where she worked throughout high school and college selling popcorn and tickets. As a graduate student in MU’s classics department, she enjoyed volunteering at the Museum of Art and Archaeology and attending films at Pickard Hall. So when she returned to campus nearly 25 years later as museum educator, the first thing on her to-do list was to restart the defunct film series. For years, at 7 p.m. every third Thursday of the month, Callaway opened the museum so visitors could tour the collections before viewing the scheduled film. But that changed when the museum moved in September 2013 to Mizzou North due to Renew Mizzou construction. No longer able to screen the films in Pickard Hall, Callaway had to improvise. First, she partnered with Nancy West, director of the Honors College. West was teaching a course called Colors, which looked at the science of color and its uses in film. Callaway instantly thought of Technicolor. That semester, she screened the Technicolor flicks Meet Me in St. Louis and All That Heaven Allows at the MU Student Center. She then drew inspiration from Men and Women, Myth and Movies, a course she was teaching, and screened the following films in Lefevre Hall: Ever After, a remake of the Cinderella story starring Drew Barrymore, and Orpheus, the 1950 French film by Jean Cocteau that updates the ancient Greek myth to contemporary Paris. Other than its Cast Gallery, the museum has been closed for more than a year, but staff is hopeful for a reopening in April at Mizzou North. Callaway knew it was time to bring the film series back to the museum. She renamed it the Ad Hoc Film Series; it was formerly called the Museum’s Film Series. “I just started to call it Ad Hoc because I was moving it to campus to coincide with Nancy West’s class and to teach my class,” said the former Latin teacher. Ad Hoc in the Latin means “for this,” or done for a particular purpose only. Mike Trial, a Mizzou alumnus and retired engineer, has been a regular since the film series began. Some of his favorite films have been the ones he and his wife, Yolanda Ciolli, had never heard of previously. The documentary about Cuban musicians in the 1940s and ’50s tied into the museum’s exhibition of artist books by a collective in Cuba. “It’s well worth the museum’s investment,” Trial said. “Having Cathy do the films keeps us energized with staying in touch with the museum. And you can’t argue with the price,” which is free. Trial is happy that the series is at Mizzou North because there is plenty of parking and the building is easily accessible. Tonight’s film is Spike Lee’s Do the Right Thing, which Callaway chose because of the recent events in Ferguson, Missouri, and because February is Black History Month. “At the end of the movie, there’s a riot and a tragedy, so I think Spike Lee’s asking, ‘What is the right thing?’ ” she said. The following films will be shown at 7 p.m. in Room 707 at Mizzou North. The series is free and open to the public. Guests should enter at the east doors (the main entrance with the overhang) and follow the hallway past the first set of elevators to the west elevators.